THE National Union of Mineworkers (NUM) said it would oppose an offer to sell its 50% stake in Ubank to Oakbay Investments, a company owned by the politically-connected Gupta family. Citing NUM spokesman Livhuwani Mammburu, Bloomberg News said the union saw Ubank as the miners’ bank and that it would not be sold. “It’s not going to happen,” Mammburu told the news agency. Earlier, NUM general-secretary, David Sipunzi, told The Star newspaper that he was opposed to the transaction. The Chamber of Mines (CoM) owns the other half of Ubank which specialises in providing finance to mining employees. The NUM and the CoM are looking for investors to inject capital into the bank, but the NUM isn’t willing to sell its entire stake, said Bloomberg News. “The Guptas will not succeed on this one,” said Mammburu. “They tried. Even the CEO of Ubank, with some board members tried to sell the bank, but it’s not going to happen,” he said. The Gupta family have attracted negative attention owing to their close business and political links with South African president Jacob Zuma and members of his family. Zuma’s son, Duduzane, has a stake in Tegeta Resources, a subsidiary of Oakbay Investments that bought Optimum Coal Company out of liquidation for R2.15bn. Optimum Coal supplies state-owned power utility, Eskom, with coal. 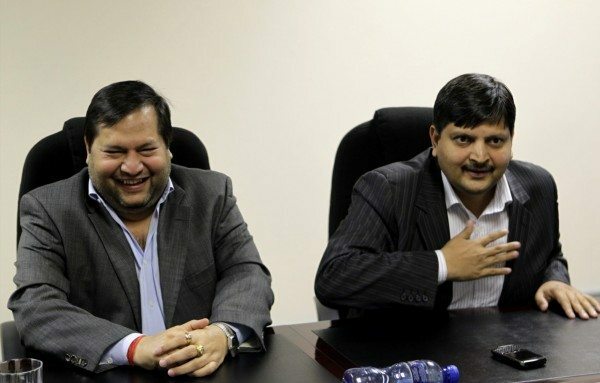 Speaking to the SABC, Ajay Gupta said that his family’s relationship with Jacob Zuma was above board. The interview was reported on by Reuters which cited Gupta as saying: “I am not a lobbyist. I am not a state capturer. “As far as I am concerned, I am a friend only”. The notion of state capture by the Gupta family was raised last year amid a series of revelations culminating in evidence by a deputy finance minister, Mcebisi Jonas, that he had been offered the post of finance minister by the Guptas. Gupta said he had never met Jonas. “I can say I have never seen him in my life,” he said. Though he had met cabinet ministers many times at business functions, his relationships with government officials were above board.